There are a number of similes that come to mind when I think about this book. It is like being doused with ice water to awake from a deep sleep in a nice cozy bed. Or perhaps it is like being knocked in the head by a steel beam that you didn’t happen to notice. Whatever the comparison, it hurts. The good news is that after you stop cringing from the pain, and get over being insulted, you realize that you really needed the rebuke. At least that’s how I felt when I read Why Revival Tarries. 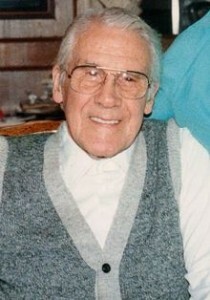 I remember hearing tapes of Leonard Ravenhill when I was a young lad. His works have impacted many Christians. I must say, however, that there is a whole new generation of young adults who have never been exposed to his teachings. We need to rediscover this man’s insights. It is surprising to think that Bro. Ravenhill spoke so strongly to the lazy and self-absorbed church in the late 1950s. While I’m sure he was right in his assessment of the church’s spiritual atrophy, I can only imagine how he would feel if he could see us now. Bro. 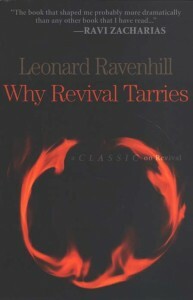 Ravenhill cries loud and spares not, in the style of the Biblical prophet, as he challenges those who “are at ease in Zion.” Far from leaving us hopeless without a remedy, the author calls us back to holiness, consecration to the Lord, separation from the world and a life of devoted, powerful and effective prayer. One reassuring aspect of the book is that you get the distinct impression that you aren’t being called to a standard that the author himself refuses to abide by. You are led to strongly believe that Bro. Ravenhill was speaking straight from his heart. The book is noticeably absent of the self-promotion and demographic-study-give-the-public-what-they-want-to-hear-syndrome that has invaded much of the Christian publishing world. It is so politically incorrect that it really is refreshing in that sense. It is hard to live on a steady diet of writings that are so devoid of conviction that they couldn’t offend someone if they tried. The fact is, the cross of Christ has always been an offense to our flesh, and it always will be. If we truly want revival, if we desire to be the true Church of Jesus Christ, we need to take a hard look at what we are holding onto that hinders us. This is a book that I would recommend, but only to a reader who truly wants to change. If you are happy where you are in your spiritual life, I’d suggest that you skip this one. It will only offend you. On a scale of 1-5, I’d give this a 4 overall. It is quite interesting when people gather to preach and pray for revival. If you preach and pray for revival, surely you ought to know what is it all about. Let not beat the air as far as this important matter of revival is concerned. Revival is just the coming back of each individual to the TRUTH. So simply? Yes so simply and this simplicity is the core problem of the nowadays apostate “Christianity” all around the world. First of all, why talking about the individual and not about my congregation? Because my Christian religion comes from Abraham who was called as an individual and decided to follow GOD without asking advice from a congregation. So, revival is the coming back of the individual to the practise of the TRUTH written in the Bible. Yes the individual practising the TRUTH written in the Holy Bible and not only talking about the Bible. Usually, in our imagination, we “feel” that if a billion suddenly rush in our mega temples all around the world, that will be revival. Let’s suppose a second that GOD accepts this fake definition and pushes two billions into our mega temples all around the world. What will these two billions “young converts” practice? 1 Corinthians 16:19. Aquila and Priscilla had a Church in their home. Colossians 4: 15. Nympha and the followers at Laodicea had a Church in their house. Philemon 1: 1-3. Philemon had a Church in his house. Do we practice this? No we have well organized mega churches. So the new two billions “young converts” will come with us in our mega temples and they won’t fellowship in five hundred millions of House Churches spread all around the world. 1 Corinthians 11:21-22. Apostle Paul is rebuking the Corinthians because during the Holy Supper, some are eating their food alone while others are hungry. So, there where food during the Holy Supper? Yes there where food, exactly as written in Luke 22: 14-20. Forget about it! We are five thousand in our beautiful temple and those fundamentalists want us to cook a gigantic food for Holy Supper. Impossible. Each of us will just have a drop of wine and a tiny piece of bread. Just think about it. Cooking food for five thousand persons! So the two billions “young converts” will do like us in our mega temples; having a drop of wine with a tiny piece of bread. Aren’t our temples and our religious governments well organized? 1 Corinthians 14: 27-28. When Christians are gathered, tongues should be spoken in order and must receive interpretation for all to understand what is said. Oh! This is not possible. When we are five thousand in our temple and the “pastor” asks us to “pray” in tongues, all of us join and talk in tongues at once. So the two billions “young converts” will speak at once in tongues with us in our mega temples. 3 John 1:7. Christians going on mission without receiving anything from pagans. No we have hospitals and schools to finance and for this humanitarian good reason, we have to collect money from freemasons who manage companies, skull and bones and rosicrusians who govern countries, illuminatis who are planning in vain to set the worldwide government of Satan and so forth. So the two billions “young converts” will join us in collecting money from Satan’s servants to “serve god”. Deuteronomy 26: 12-14 says that if I commit myself into the law of tithes, I must respect the year of tithes; the third year of tithes. If I practice the law of tithes but do not respect this third year of tithes, then Galatians 3:10 puts me under the curse of the rebel who pretend to respect the law but who do not fully practice the law. No, I won’t take this WORD into consideration because my temple’s “pastor” only taught me about paying tithes and not about the third year of tithes. So the two billions “young converts” will pay the tithes as I do, without respecting the third year of tithes and they will live under permanent curse while waiting for “blessings”. Roman 13: 1-4 says that I must loyally subject to the governing authorities who are not a terror to people of good conduct, who bear the sword to punish wrongdoers and approve and commend people doing what is right. Forget about this! These fundamentalists are persecuting us with Bible verses. When our interdenominational fake “pastors”, many of whom are illuminatis, call us to gather in our mega temples and “pray” for our heads of states and our governments members, we do not need to check carefully if they are illuminatis, skull and bones, free masons, rosicrusian, bilderbergers plotting to set up the worldwide government of Lucifer before “blessing” them in “prayers”. Our “pastors” of our beautiful mega churches have not taught us that we should carefully check their spiritual nature and goal before “praying” for them. Psalm 149 says that it is an honour for Born again Christians to bind illuminatis, Satanic free masons, Satanic rosicrusians, skull and bones, bilderbergers governing nations with chains and fetters of iron and to execute upon them the judgment written in the Bible. Forget about this! Our “pastors” in our mega temples have never taught us such things and we prefer to obey our “pastors” than to practise what is written in the Holy Bible. By the way, which kind of judgments does GOD request me to proclaim against illuminatis and other Satanists governing countries around the world? Fool, these judgments are well written in Jeremiah, Ezekiel, Isaiah; Daniel and so forth. They are not hidden in the stars which are in the sky. But why did my mega temples’ “pastors” never taught me about all this? Fool, have you ever seen Satan waging war against Lucifer? The Bible says that as Satan disguises himself into an Angel of light, so does your mega temples’ so called “pastors” around the world who themselves are satanists, disguise themselves into Ministers of GOD. Dare you ask GOD in prayer and fasting to show you the real spiritual nature of your mega temples’ “pastors” who teaches you to “bless” the satanic heads of states and government members who are destroying the world to establish the worldwide government of Satan? Too challenging for you. Is not it? You gave your life to humans and never learnt to actually put your trust only in the WORD of GOD. Yes, dare you ask GOD to reveal to you the real spiritual nature of your mega temples’ “pastors” around the world? No, you trust him too much, up to the extent of despising Psalm 149 written in your Holy Bible. Instead of putting your trust in Psalm 149 written in your Holy Bible, you have put your trust in your mega temples’ so called “pastors” around the world. GOD says that the consequence of putting one’s faith in human (instead of trusting the WORD of GOD) is a curse. So, the two billion “new converts” will join our worldwide chorus of fake “prayers”, “blessing” heads of states and government members who are illuminatis, skull and bones, free masons, rosicrusians and who are plotting in vain to set up the worldwide government of Lucifer. They will never fast and pray for justice to be established in countries around the world. They will only join our “mega prayers” for “peace”; thought my Bible says that peace comes from Justice, meaning that even a fool will understand that before looking for a baby named “peace” you must first have a married couple called “Justice”. Is Isaïah 32: 17 written in my Bible? I don’t know but I will ask my mega temple’s “pastor”. What is Elijah saying against ( yes against ) the Antichrist king of Israël Ahab who in fact represents all our illuminatis, bilderbergers, freemasons, rosicrusians, bohemians, trilateralists Head of States around the world who are trying hard to achieve what Ahab failed to do that is implementing the government of Satan on earth? Dogs shall lick your blood, even yours. Your household will be like that of Jeroboam son of Nebat. Dogs shall eat your wives by the wall of Jezreel. Any belonging to you who dies in the city shall the dogs eat. Any belonging to you who dies in the field shall the birds of the air eat. What is Micaiah saying against ( yes against ) the Antichrist king of Israël Ahab who in fact represents all our illuminatis, bilderbergers, freemasons, rosicrusians, bohemians, trilateralists Head of States around the world who are trying hard to achieve what Ahab failed to do that is implementing the government of Satan on earth? 1 Kings 22: 8 reveals that Micaiah always ( yes always ) prophesy evil ( pure evil as the Bible says ) against them. No, we cannot because, you know, we are no more under the Old Testament time. Anyway, in my Bible school, they say that there is no more prophetic ministry because this ministry was only for those ancient times. Can you just imagine us gathering our five thousand members in our mega temples to pray against our illuminatis Head of State? This is just not possible because some of his government members are in deep religious fellowship with us in our mega temples though they fiercely work to establish Lucifer’s government all over the world as soon as they step out from our mega temple after the joyful sunday service. Now, it is clear that GOD won’t answer all those fake “preachings” and “prayers” for “revival” because they aim at filling the temples and not at bringing the individual to the practice of what is written in the Holy Bible. So, Born again Christians, if you are daughters of Jerusalem, do not weep for JESUS anymore, but weep for yourselves and for your children ( Luke 23: 28 ). 1/ LORD JESUS, please expose and cast out from Christianity all the millions of fake “pastors” lying in stony and wooden temples all around the world. 2/ LORD JESUS, please destroy all the stony and wooden temples all around the world and bring true Born again Christians in House Churches as written in the Holy Bible. 3/ LORD JESUS, tell my pastor that if he is a true Pastor, let him get out from the temples and lunch House Churches where he can teach and practice the TRUTH with Brethren and Sisters. http://www.worldwiderevival.org ( this web site has been blocked and destroyed by illuminatis and free masons and bilderbergers who “fellowship” every sunday with you in your mega temples all around the world. At the end, everlasting brimstone and fire will “pray” for them and for those “praying” for them and not against them ).